As I mentioned in my last post, I bought a Blush jelly roll and 3 yards of coordinating fabric for a Paintbox quilt I'm planning to make. I also bought 3 yards of Kona cotton on sale to go with it. That's a total of 9 yards - but I expect to get at least two quilts out of it. I also bought a lot at JoAnn's this week. I had a bunch of 40 and 50 percent off coupons plus another coupon for 20% off my entire purchase. (Aren't coupons wonderful?) I bought 5 yards of fabric for a special someone but I can't share what until later. 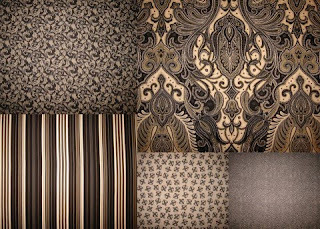 I also bought 8 yards of the Legacy Studio Ravendale Collection in 5 different prints. Most of this will go towards making a sampler quilt that Jan and Janet will be teaching this next year. However, I have enough left over to frame a John 3:16 panel I have. Aren't they pretty? I've really been gravitating towards these colors lately. I think the pattern in this fabric would also make a great quilting motif. This brings my purchase total to 25 yards! Yikes! I guess it's a good thing I ended up not going to the Mid-Atlantic Quilt Festival. Now for what I got accomplished this week. Hmmm... I have to think about it. The only thing I can think of is the 18 pillowcases I made for the 1 Million Pillowcase Challenge. That used about 20.25 yards of fabric. ( I also made some barbie clothes while visiting my mom, but we used her fabric not mine.) I've got another 26 cut out and ready to sew and I will have used the bulk of the children's prints and flannels in my stash. Although I've still used more than I've bought, I need to stay out of the fabric stores. I have enough projects to work on without adding new ones. Having said that, I do want to get one more coordinating Ravendale print for the sampler that starts next week.